Tilapia is one our favorite fishes. 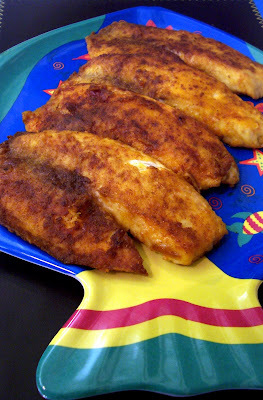 It's mild, relatively inexpensive, and the small fillets cook quickly. We used to keep a large box of them in our freezer, but the brand turned out to be farm raised in China, so now we buy fresh and check on the origin. 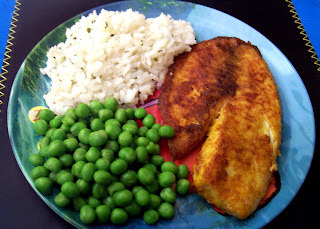 I almost didn't post this recipe, since it's just an easy pan-fried fish, but it's quick, reasonably healthy, and The Kid loves it. It's a little short on measurements, so I'll go a little long on directions. Barely cover the surface of a large skillet or frying pan, preferably cast iron, with olive oil. Begin heating to medium high, so it's ready at the same time as the tilapia. Place fish on paper towel and pat dry. 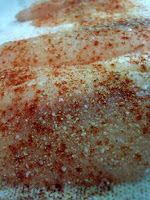 Sprinkle top side of fillets with garlic powder, paprika, kosher salt, and fresh ground white pepper to taste. Place seasoned side of fish downwards on a plate of flour. 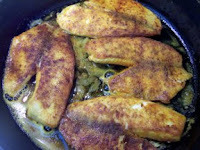 Sprinkle top (unseasoned) side of fish with additional garlic powder and paprika. Dredge both sides in flour, and gently shake off excess. Place in pan, and repeat with the other fillets. It goes well with cornbread, but tonight we had rice and peas. (Yes, that is a Nemo plate underneath.) And now it's ALL GONE. This is a great recipe! I'm working on an allegy post at www.tilapiablog.com. When did you introduce fish to your kids? Yum! We really enjoyed this recipe, thank you :-)I've been poking around your recipe section, pure gold! Charles, hope you enjoyed the fish, the lemon pepper combo sounds good!